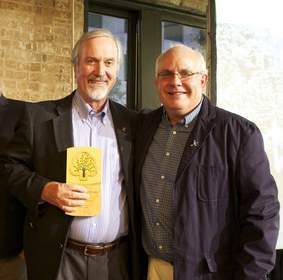 NEW ORLEANS, LA--(Marketwired - Oct 27, 2014) - Last night, the Forest Stewardship Council® (FSC) US selected Robert J. Hrubes, Executive Vice President of SCS Global Services, as one of two co-recipients of the first-ever "Uncommon Partnership for FSC Leadership Awards." The award was presented at the "Design & Build with FSC" Awards Ceremony at Greenbuild 2014 in New Orleans. Hrubes is an internationally recognized expert in natural resources management and environmental certification. Together, Hrubes and his co-recipient, Richard Donovan of Rainforest Alliance, were recognized for their commitment to creating a marketplace that "promotes environmentally appropriate, socially beneficial and economically prosperous management of the world's forests." "It is a genuine honor to be recognized by the FSC US," said Dr. Hrubes. "Protecting forest ecosystems while maintaining a robust lumber industry has been a lifelong passion and professional pursuit. I'm delighted to share this honor with my longstanding professional colleague, Richard Donovan, who shares this mission." "Dr. Hrubes has been a leader in FSC since before it even existed," said Corey Brinkema, President of the Forest Stewardship Council US. "His steadfast commitment to leadership standards, especially in North America, has helped transform forest management, creating immeasurable environmental and social benefits for forests and people," he added. SCS first engaged Dr. Hrubes in 1991 to guide the design and implement its ground-breaking forest certification program. In addition to being principal architect of the SCS Forest Conservation Program, he participated as a founding member in the Forest Stewardship Council (FSC), helping to design that certification program. He served for five years on the founding FSC International Board of Directors and was the founding chair of the Board of Directors of the Forest Guild, a US-based professional forestry organization. Maintaining his role as a hands-on certification practitioner, he has served as team leader on evaluations of forest management operations worldwide, and has served as auditor on numerous chain-of-custody certification evaluations. Over the past 20 years, Hrubes has also served on key FSC Working Groups such as those that designed the concept of high conservation value forests and developed the International Generic Indicators. Dr. Robert Hrubes and Richard Donovan awarded for long-standing dedication to FSC and leadership through an uncommon partnership.